The Redbury New York is located in the burgeoning NoMad district of Midtown Manhattan and features inviting accommodations amidst the energetic city. Suitably located for those wishing to explore all the Big Apple has to offer, landmarks such as the Empire State Building, Madison Square Park, and countless culinary delights are easily accessible. This historic hotel originally opened in 1903 as the first hotel in New York City for single, professional women. It was designated as a historical landmark by the New York City Landmarks Preservation Commission in 2012 for its architectural and historical significance. Also located in this legendary neighborhood was Tin Pan Alley, home to the late 19th and early 20th century music publishing mecca. World-renowned photographer and Redbury Creative Director, Matthew Rolston, dove deep into New York’s illustrious history as one of the birthplaces of American popular music, incorporating elements of this narrative into the property’s 265 newly-renovated guestrooms and interiors. Each guestroom features plush down duvets, 300-thread-count bedding, slate-tiled baths with backlit mirrors and sbe’s signature Ciel® bath amenities, a high-definition flat-screen television, and WiFi. The on-site signature restaurant, Marta, is a Roman-inspired pizzeria from Danny Meyer’s Union Square Hospitality Group, and the cozy lobby bar, Bar Marta, features vibrant cocktails, craft beers, fine wines, and champagne. Guests can maintain workout routines with daily passes to New York Sports Club and pets are welcomed to stay. 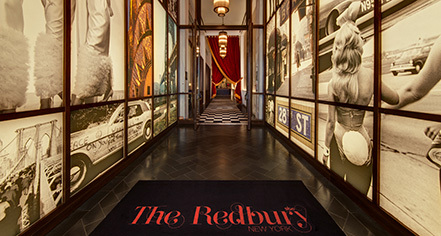 The Redbury New York, a member of Historic Hotels Worldwide since 2016, dates back to 1903. The hotel is featured in the movie Valley of the Dolls; Anne Welles stayed there after arriving in New York for the first time. Airport: The nearest airports are LaGuardia Airport (LGA), John F. Kennedy International Airport (JFK), and Newark Liberty International Airport (EWR). Early Check-In/Late Check-Out: $50 fee for early check-in or late check-out. Extra Person Fees: $30 per person. Hotel/Resort Fees & Taxes: A Hotel Service Fee of $28 per day, per room (plus tax) will apply to booking. The fee includes: WiFi access throughout the entire hotel, access to digital copies of The New York Times and The Financial Times while on property, coffee service in the lobby, evening turndown service upon request, printing of incoming faxes and boarding passes, unlimited local and toll free calls, copy services, notary services, map of New York City, and daily passes to New York Sports Club. Occupancy Restrictions: Maximum occupancy is four (4) people. Parking: Overnight, covered garage parking is available. Pricing: $45 sedan, $55 SUV, per 24 hours (with a hour grace period). Payment: American Express, Visa, MasterCard, Diners Club, and Discover credit cards are accepted. Pet Policy: Dogs 35 lbs. or less are welcome. Only one (1) dog is permitted per stay with a one-time non-refundable fee of $150. Shuttle Service: Shuttle service to and from the airport may be scheduled through the concierge. Rates apply. Smoking Policy: Non-smoking hotel. A $500 fee will be imposed for guests that fail to comply. Transportation: Transportation, including limousines, car services, car rentals, or airport shuttles, may be arranged through the concierge. Rates apply. The Redbury New York is located in the burgeoning NoMad district of Midtown Manhattan and features inviting accommodations amidst the energetic city. 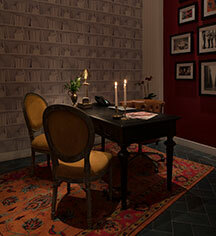 Learn more about the History of The Redbury New York .